If you have a dare to spare while in Iloilo, you can hop on a ferry and take a quick day tour in Guimaras, a province known for producing consistently sweet mangoes. That’s what we did, and our Guimaras itinerary included island hopping in the morning and a land tour in the afternoon, after which we took a late-afternoon ferry back to Iloilo. Guimaras came as a surprise. 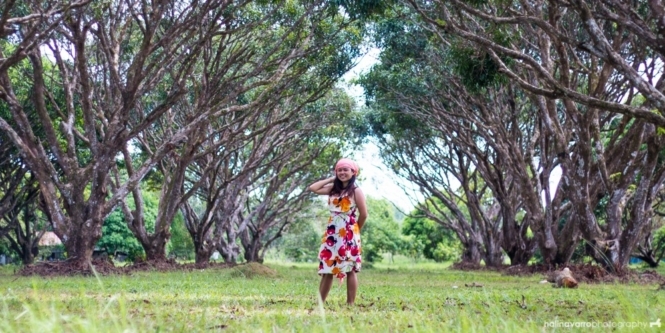 It’s one of the smallest provinces in the Philippines, but it’s charming in its own way. It’s quiet, with roads surrounded with greenery. It also offers activities for tourists, mainly beach activities and land tour on its natural and man-made attractions. We had an early start on our Guimaras itinerary so we can island hop in manageable sea condition… and also because the weather was really nice. We availed of the private island hopping package by Raymen’s Beach Resort and asked for an open time. Ready for island hopping in Guimaras. 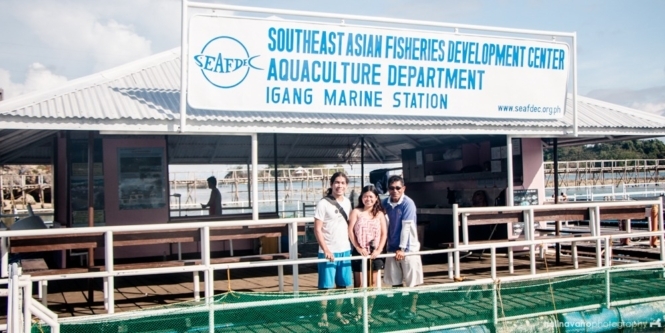 Our first stop is at SEAFDEC (Southeast Asian Fisheries Development Center), also known as Igang Marine Sanctuary. We toured the facility, looked at fish pens and listen how the sanctuary does marine research through the help of local scientists, some graduates from the top university in the country. The sanctuary also holds private seminars for businessmen, teaching them proven methods for enhancing fish growth and so on. A pawikan in SEAFDEC marine research facility. SEAFDEC offers educational tour, so it may not suit everybody’s taste. We both happened to like it. Hali was delighted to see pawikans, which seem friendly to people. We threw food pellets in the fish pens, watching how aggressive some of the fish species are. We also bangus or milkfish, lapu-lapu, pompano, lion fish and other kinds of fish I’d forgotten the names of. Meanwhile, I liked SEAFDEC because it reminds of Juag Lagoon Sanctuary in Sorsogon, which is maintained through Kuya Alex’s passion for taking care of the marine life. We saw the same knowledge, diligence and passion in here. We headed next to Ave Maria Island and Pawikan Island. 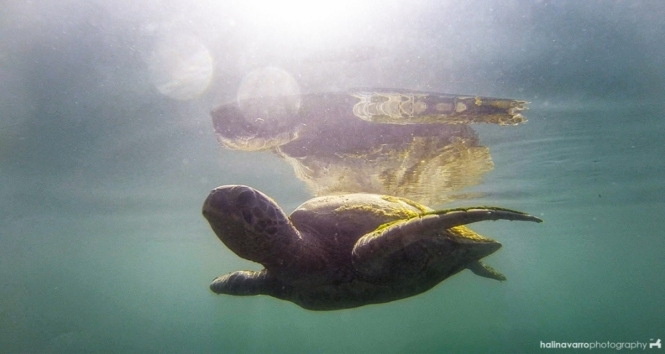 Pawikan Island is no longer home for pawikans, as the turtles have already been transferred elsewhere. It was still low tide though and our boat couldn’t get across, so we chose to snorkel near the boat. Snorkeling there turned out to be a very good decision. There were fishes and various large corals underneath. It was early in the morning, and the water was still clear. We spent the majority of our time in island hopping here. By the time it was high tide and the water had gone a bit murky, we were already spent. Baras cave, a favorite stop when island hopping in Guimaras. Afterwards, we passed by Baras Cave. 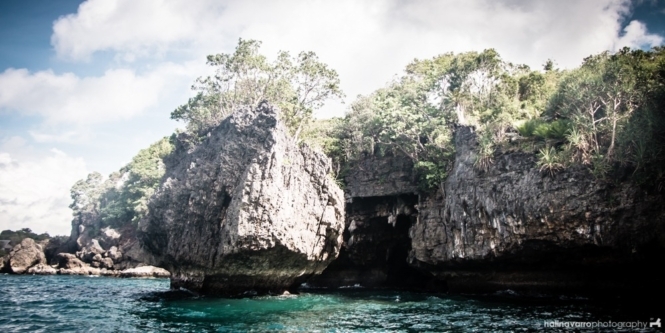 Baras Cave features two entrances, and given the right weather condition, a boat can enter through the cave. I was looking forward to this, but our boat couldn’t even come close due to the strong waves brought by the habagat season. The next hour was spent touring the remaining island hopping attractions, including Lamurawan Island and Natago Beach. After about 3 hours of island hopping, we went back to the resort. We actually didn’t plan on doing a land tour since we were quite short on time, but since we finished earlier than expected on island hopping, we decided to go through with it. We’re glad we did because it allowed us to have a more thorough feel of what Guimaras is like… serene, quiet and beautiful. 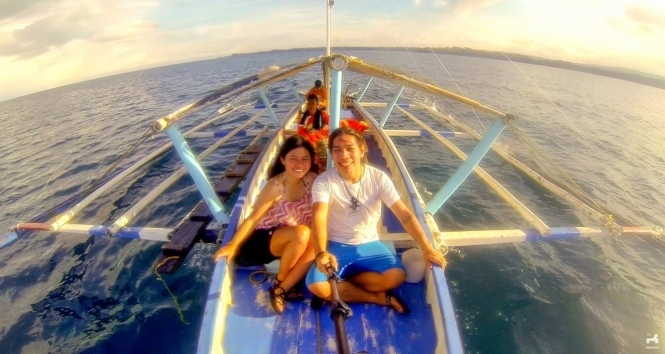 A land tour in Guimaras requires 5 hours at most, due to great distances between land attractions. Some of these aren’t really worth visiting based on what I read from blogs online. We only chose selected stops from the list. The Guisi Lighthouse is the farthest land attraction in Guimaras and also my favorite among the places we’ve visited here. 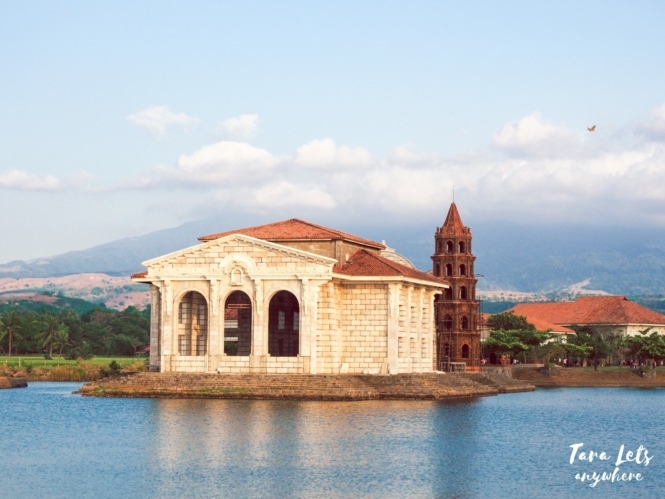 It’s an 18th century architectural work built to guide ships steering along Panay Gulf. The lighthouse has turned rusty, the walls in the ruins taken over by plant roots. The Guisi Lighthouse is perfect for photo-shoots. Tree roots over the walls add charm to the walls in the old lighthouse. I can see how couples would decide to do their pre-nup shoot here. 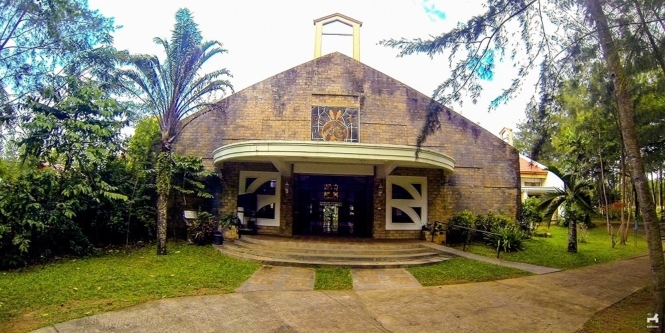 The Trappist Monastery grounds features a church and a store for buying pasalubong, especially local delicacies. There are assorted mango-flavored delicacies such as mango bars and mango otap, different-flavored crinkles, mango and calamansi jams, among others. There are also religious and souvenir items such as keychains and wallets. I’d bought a lovely shell-decorated wallet for P135 and boxes of mango bars, which an officemate raved about. This is where Guimaras produces their world-famous sweet mangoes. We’d skipped the Pasalubong Center next and headed to a mango plantation. It’s a short unguided tour of the plantation. There are about 5000 mango trees in the plantation, including seedlings. If you’re a nature person or you’re interested on production of mangoes in Guimaras, you’ll appreciate visiting the mango plantation. Mango pizza served at the Pitstop, a must-try. Before ending our day tour in Guimaras, we had merienda in Pitstop, a restaurant that offers various meals with mangoes. 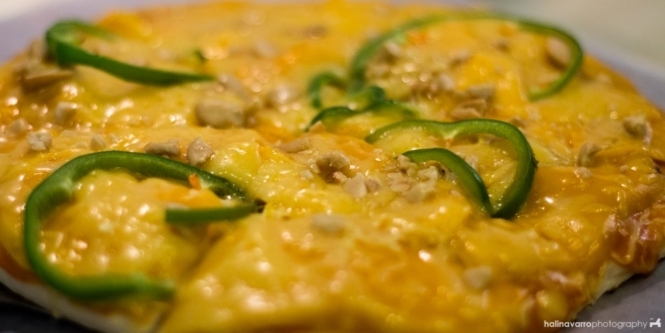 There are mango bulalo, mango pasta and it’s famous dish — mango pizza. The mango pizza was surprisingly good. The sweet taste of mango blends perfectly with melted cheese. The crust is thin and crunchy, and the cashew bits on top adds the right bite. There are great beach resorts in Guimaras, so if you have time, might as well extend your Guimaras itinerary to 2-3 days. For those backpacking across multiple provinces, one day in Guimaras is good enough. As for us, we only spent one day Guimaras. We allotted the morning for island hopping and then island tour in the afternoon. Here are the details you need to know about exploring Guimaras. You need to rent a tricycle or multicab to tour Guimaras. You can do this in half day or whole day. Since we only have half a day, we visited only selected tourist attractions here. 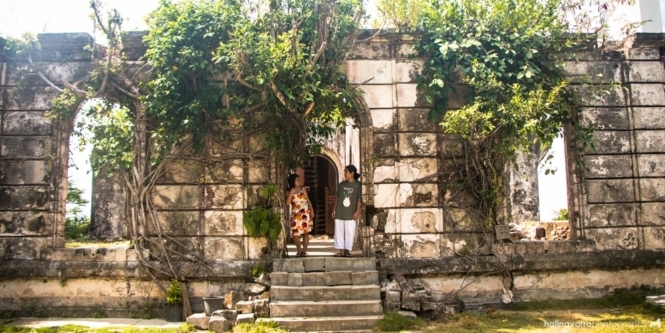 In particular, we recommend going to Guisi Lighthouse and Beach, Mango Plantation, Trappist Monastery and the Pitstop. Take note that visiting Sadsad falls is seasonal, since there are months where there is little stream. The windmill farm is a new attraction and requires an additional P300 on top of the land tour rate. P.S. This post is part of our 5-day Antique-Iloilo-Guimaras trip. See other places we’ve been to in this trip. How much was the boat for the island hopping? and what time did you start? This is a really helpful guide. 🙂 I’m visiting Iloilo and was thinking of a way to maximize going to Gigantes and Guimaras. This helped! Thanks! Hi, is the land tour also offered by Raymen’s Beach Resort? Thank you! is there a 1 day tour for 14 persons ? what does it mean by 14 pax, 5 pax?is it persons? Hi, does the land tour DIY or you rented for tour package? And how much is your budget for both island and land tour? Please send one day tour package to guimaras island, including itineraries. Planning to be in Iloilo last week of November. Thank you.